What’s New: A new Intel study finds consumers look forward to a self-driving car future even while harboring fears and uncertainty now. The survey1 of U.S. consumers found that only 21 percent of Americans would swap their cars for self-driving cars today, even though 63 percent expect such vehicles to be the norm in 50 years. That future vision fits with an earlier study in which Intel predicted a passenger-centric future worth $7 trillion by 2050. Why It Matters: Intel’s 2017 Passenger Economy report found that self-driving vehicles have the potential to save 585,000 lives from 2035 to 2045. But Intel’s new study found consumers conflicted about this promise. Nearly half of consumers surveyed (43 percent) said they don’t feel safe around autonomous vehicles (AV) – with women more fearful than men. At the same time, more than half of consumers look forward to the day when they won’t have to drive and expect to be using their car time for entertainment or work within 50 years. Create widespread availability, education and acceptance of advanced driver assist systems (ADAS). Without the learnings gained from people experiencing ADAS at scale, it is unthinkable to expect them to universally leap the proverbial technology chasm and accept full autonomy. More Context: Autonomous driving not only offers the promise of significant social benefits – including saving lives – it will also unlock new passenger experiences. Cars will no longer simply be about mobility, they will hold the potential to become experiential transportation pods. The 2017 Passenger Economy Report was commissioned by Intel and conducted by Strategy Analytics. 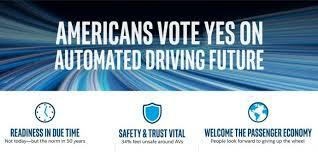 And learn more about autonomous driving at Intel in its Newsroom press kit. 1Study Methodology: PSB conducted research on behalf of Intel to explore attitudes and perceptions of technology today and 50 years from now. To meet these objectives, PSB conducted an online quantitative study from May 9-20, 2018 among the U.S. general public (n=1000) and U.S. technology elites (n=102). For more information, visit www.psbresearch.com. 2“How autonomous vehicles could save over 350K lives in the US and millions worldwide,” ZDNet 2018.